Eight very distinct genres of analogue dirt pedal in one box can never be a bad thing, especially when they sound as good as these. Vast range of analogue dirt tones with complementary EQ. No stacking of two sounds. Elektron, a hi-tech music company from Sweden best known for its synths and drum machines, recently made its first effects processor - the Analog Heat, a desktop stereo distortion box with filtering and EQ, designed to take a line input. 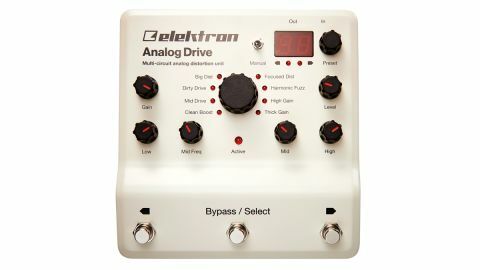 Its latest product - and its first foray into the guitar pedal market - is the Elektron Analog Drive we have here and takes some of what the Analog Heat does and puts it into rugged mono stompbox form with high-impedance input to suit guitars. What you’re getting here is an array of eight different distortion tones plus three-band EQ, all generated with analogue circuitry but with digital control, so you can store and recall all the knob-set parameters into the 100 onboard presets. There’s also external MIDI control of all parameters if you need it, and sockets to add a couple of expression pedals. In width, the unit is about right for a pedal that sports three footswitches, but it is almost 18cm deep so will take up a fair bit of pedalboard space. You may also find that you’re tied to using its supplied adaptor because its power requirements may be more than your regular power distribution unit can handle (the supplied adapter is 12 volts, 1000mA and centre positive). The centre footswitch is the standard bypass switch, but it’s also used to activate a new preset that you select via the outer preset up and preset down footswitches. Okay, so it’s two footswitch steps, but if you set up your patch order carefully and prime one ready to load, you can seamlessly change your distortion choice at the correct point during a song. You can also scroll through presets and select them with the Preset knob, and if you just want to work from knob position alone, you just flick a switch to take you into manual mode. Eight different distortion types are called up by a large rotary knob with separate knobs to balance the gain and output level. The EQ section offers low- and high-end tweaks on separate knobs, and a two-knob midrange control where one knob sets the relevant frequency and the other either cuts or boosts it. In terms of sonic range, the Analog Drive may just have all the flavours of drive/distortion you need, and they all sound superb - there’s not a dud among them. The first of the eight is Clean Boost with up to 20dB extra, plenty of options with which to hit your amp’s front end with or without EQ. The Mid Drive is Elektron’s spot-on interpretation of a Tube Screamer, while Dirty Drive has more gain and puts us in the mind of small cranked American amps with a hint of fuzz around the edges on higher settings. On that amp-flavoured vibe, if you’re looking for the sound of a flat-out Marshall stack, the Big Dist setting is for you. It’s a Marshall-in-a-box that completely nails it. Focused Dist takes its cue from Klon-style pedals, doing an accurate take while extending the capability with more gain and EQ. The Harmonic Fuzz setting - apparently based on an unnamed out of production octave fuzz - is a practical workaday fuzz with a lovely tickle of upper octave in there and plenty of variation via the EQ. The Analog Drive may just have all the flavours of drive/distortion you need, and they all sound superb - there’s not a dud among them. Incidentally, that EQ section is nicely balanced, enhancing all of the eight without getting too out there. The final two settings, High Gain and Thick Gain, offer the most distortion with plenty of stuff for rock and metal, so if you’re looking for heavy palm-muted rhythms or fat harmonically rich sustain for single-note leads, you’ll find it here. Performance options are extended with the expression pedal inputs. One controls gain so you can set it up in conjunction with the Gain knob to give you a little bit extra when you need it - which is brilliant for pushing a note into controlled feedback on some settings. The second expression socket allows you to control the mid EQ, letting you sweep through the frequencies for wah effects. Not everyone will need so many variations, but it could be a no-brainer for a guitarist who has to accurately reproduce a wide range of covers in a set or needs a comprehensive distortion tool for studio work. Okay, for the price, you could arguably get a decent set of separate pedals with the added advantage that you could stack them, but the Analog Drive’s multi-flavoured nature, powerful EQ and preset storage/recall offer a capability that’s hard to resist.